Ask someone their favorite part about living in North Carolina, and a likely response will touch on the accessibility of both mountains and ocean. From mile-high peaks to rolling farmland to wind-swept sand dunes, the Tarheel State is, indeed, fantastically diverse. And one day, a single, unbroken footpath called the Mountains to Sea Trail will connect these unique geographic regions in a more intimate way than a road ever could. But for now, the MST remains a work in progress and a 40-year testament to the vision and passion of an increasing number of everyday heroes. The scope of the cross-state project is impressive. The entirety of the 1,150-mile MST exists within the borders of North Carolina, with more than 680 miles of the trail currently built. (By comparison, the 2,180-mile Appalachian Trail traverses 14 different states.) Even though it's still under construction, it's possible to thru-hike the MST using road connections; in fact, more than 60 hikers are registered as MST finishers. Creating and maintaining a trail of this magnitude is no easy, or quick, task. The idea of a trail to traverse the Old North State was first proposed in 1977 by Howard Lee, an NC Senator and the first African American elected as mayor of a predominantly white Southern town, Chapel Hill. When progress on the MST faltered in the mid-1990s, the non-profit group Friends of the Mountains to Sea Trail was formed to advocate for the trail and organize its huge volunteer force. Dixon says some 30,000 volunteer hours were spent on the MST in 2015. That sweat equity was supplied mostly by 17 groups throughout the state, some directly affiliated with the FMST, others independent entities that care for all sorts of trails in their area. Collectively these teams are responsible for the maintenance of 530 miles of existing trail and, on average, build around 10 to 15 new miles each year. 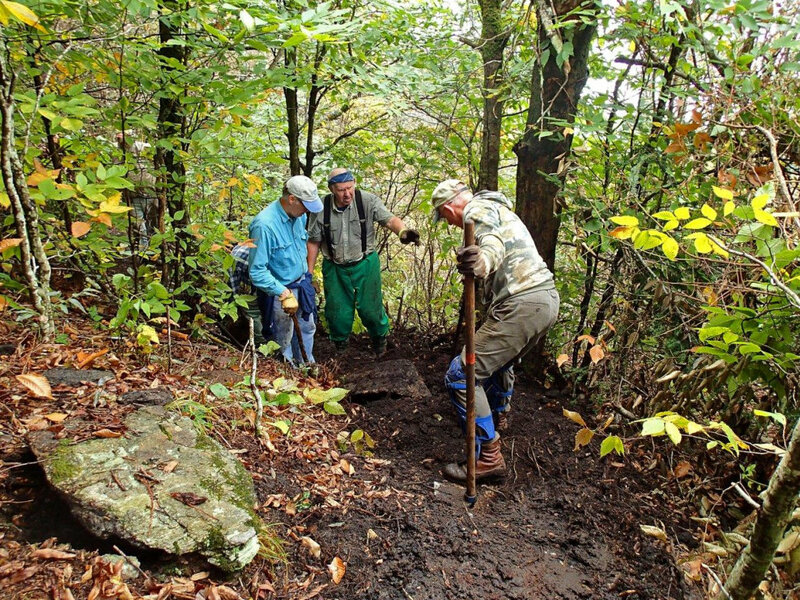 Volunteers with the Elkin Valley Trail Association, for example, are ambitiously creating both new trail and support infrastructure for hikers. Farther up the Blue Ridge, the Carolina Mountain Club maintains 140 miles of the MST and recently built a section at Water Rock Knob that Dixon says was among the most difficult projects on the whole trail. 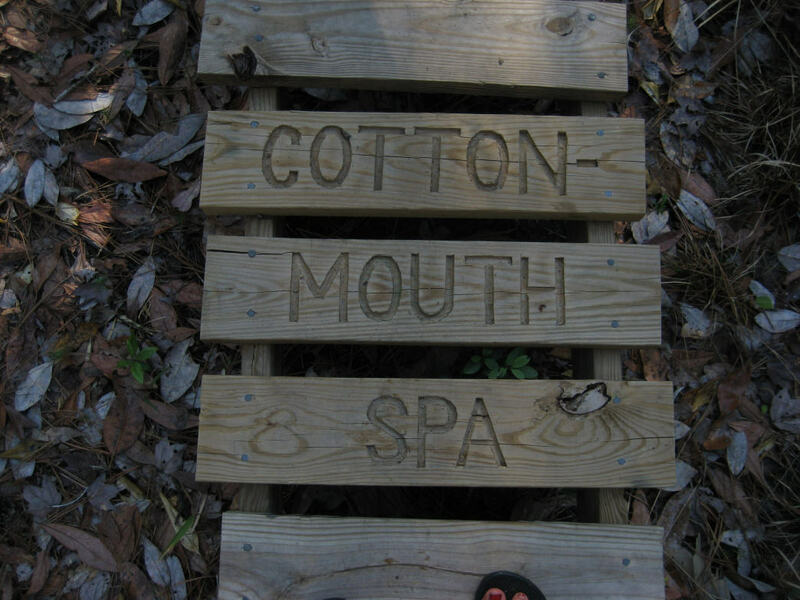 Officially, the Mountains to Sea Trail falls under the jurisdiction of the North Carolina State Park Department. And while it does receive some priority grant dollars for specific projects from the state, it is not directly funded like other parks in the system; the primary source of dollars that keep the trail operational come from corporate and private donors. Besides volunteering for trail work, Dixon says the best way to support the trail is by becoming a member of the FMST. The experience of hiking the full length of the Mountains to Sea Trail differs from other-long distance paths in the U.S., like the Pacific Crest Trail or the AT: The long walk across North Carolina can provide a more intimate, interpersonal experience. Passing through the mountain towns, farming communities, and seaside villages opens a window into the diverse cultures that occupy them. In case you haven’t banked the two months’ worth of vacation it typically takes to complete the trail, there is a long list of locations that allow day hikers to experience a piece of the trail. The Friends of the Mountains to Sea Trail website is an absolute treasure trove of vital information for accessing the MST. To make this information more manageable, the trail has been broken into sections, each one with a well-organized guide. To get you started, Dixon has recommended four day hikes that show off the variety found along the MST. This high-altitude spot along the Blue Ridge Parkway offers one of the most easily accessible and amazing views of the entire MST. A short trail to the top begins at the Water Rock Knob overlook at BRP Milepost 451.2. There are bathrooms and even a small store here. The roughly one-mile roundtrip hike is near the edge of Smoky Mountain National Park and makes a fantastic stop on the way out to watch the sun setting over the valley a thousand feet below. The MST connects many of the state's most noteworthy natural landmarks, but few such places have distinguished themselves more as a symbol of North Carolina’s unique beauty than the cylindrical rock monadnock at Pilot Mountain State Park. Several of the state park’s trails share the MST designation. Entering the park from the south, parts of the Corridor, Mountain, Grindstone, and Grassy Ridge Trails are marked with the familiar white blaze that designates the Mountains to Sea Trail. Map segment 6 describes which pieces of these trails are on the MST. 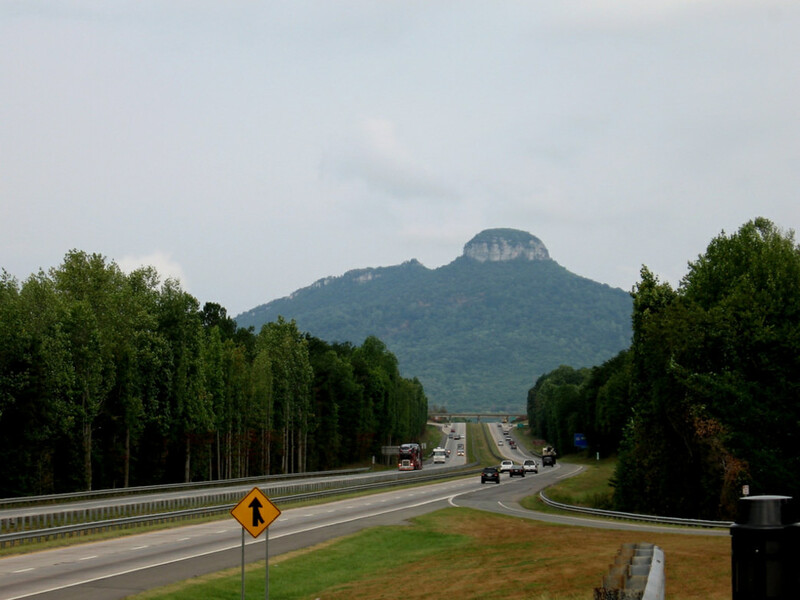 Far to the southeast of Pilot Mountain, where the rolling hills and red clay of the Carolina Piedmont give way to the flat, sandy soil of the coastal plain, the MST passes near another geological oddity: the Carolina bay. These elliptical depressions vary in size and depth, but all share a northwest-to-southeast orientation. Debates surrounding their origins are generally contained in two camps: Those who theorize the bays were created by a geological event and those who believe they are the result of a celestial impact. 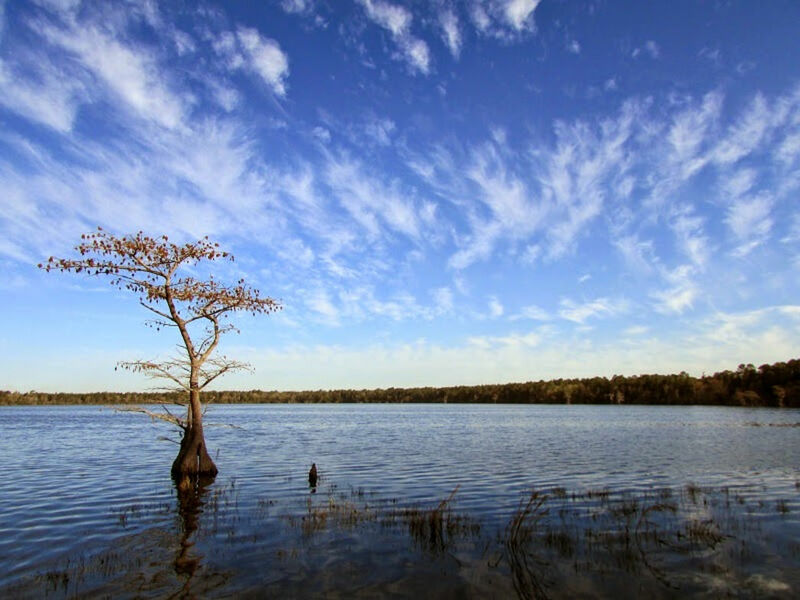 A day hike on the MST at Jones Lake State Park offers a firsthand opportunity to investigate a Carolina bay and decide which theory you subscribe to. The walk connects to a loop trail around Jones Lake, one of the larger bays in the area. 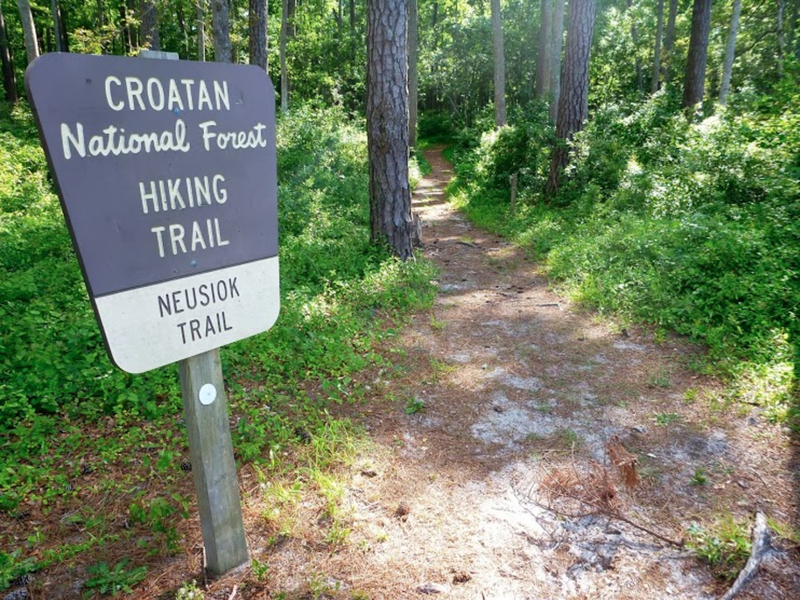 Nearer still to the Carolina coast, the MST passes through the incredible biodiversity of Croatan National Forest and joins the 20-plus mile Neusiok Trail. Multiple bridges and boardwalks offer comfortable passage over raised swamps (called pocosins) and through dense forests of pine and cypress. Black bear, deer, osprey, eagles, and the infamous Venus flytrap all make their home in the forest, as do much smaller inhabitants. Dixon suggests hiking in this area from fall through early spring to avoid the high times for insects. Plan for your exploration of this area with the help of the segment 17 guide.